The BlackRock Science and Technology Trust performance over the past two quarters suggests its geographic and market-cap mixes are vulnerable to current macro forces. With a sizable mid- and small-cap component, the fund's assets could be threatened by volatility if growth concerns are confirmed. The emerging markets components (accounting for 18% of assets) could weigh on the fund's performance compared to other technology ETFs. BlackRock Science and Technology Trust (BST) is an equity fund looking for accelerated capital gains by investing in science and technology companies with high growth potential. As listed on the fund's profile, "under normal market conditions, the Trust will invest at least 80 percent of its assets in equity securities issued by U.S. and non-U.S. science and technology companies in any market capitalization range." In addition to gains generated by price growth and dividends, the fund will also employ a strategy of "employ a strategy of writing (selling) covered call options on a portion of the common stocks in its portfolio." Investors who are looking for a high growth investment will find the fund's components enticing. However, in an environment with global growth expected to slow and credit conditions tightening, the risk may be too high. Shares of BST have been on the rebound since 2019 began. After turbulence sent the stock market tumbling in the fourth quarter of 2018, shares recovered from a 52-week low of $23.92 to about $34, a 42 percent gain. This is just over $2 short of a 52-week high set in October of $36.10. Near the bottom of the sell-off, investors were paying about 4.84 percent over NAV, but that gap has widened to about 5.87 percent more as of April 8, 2019. This trend suggests there's still a lot of support for BST despite the shaky fundamentals overall. The premium could keep getting wider if sentiment turns more positive, and even in an event of a sell-off, the spread should see resistance around 4.5 percent. Looking at BST compared to some major technology exchange-traded funds (ETF), one can see that BST is a lot more spread out than its counterparts. All of the four selected ETFs have at least 27 percent of the fund invested in either Microsoft (MSFT) or Apple (AAPL), two of the most popular mega-cap technology companies on the market, while BST has only 7.6 percent holding the two. Another interesting observation is that two of BST's top ten components are based in China (Tencent (OTCPK:TCTZF) (OTCPK:TCEHY) and Alibaba (NYSE:BABA)). From this perspective, it seems that BST opts to construct a riskier portfolio with more growth components while the other ETFs are invested in more value plays. While the major ETFs have over 85 percent of its fund invested in large-cap stocks (which are often mega caps), BST only has two-thirds of its assets invested in large caps. 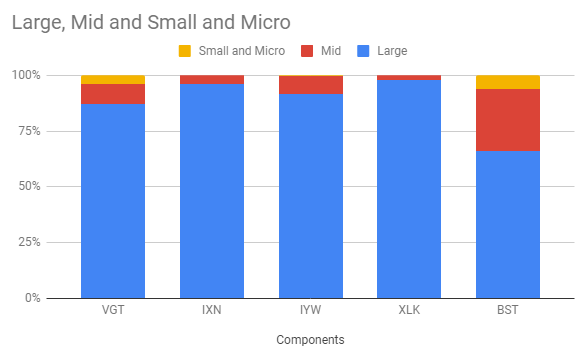 On the other end, BST's percent invested in small- and micro-cap companies is well above the ETFs with 3 out of the 4 having almost 0 percent invested there. In an economy that's threatening to slow, these kinds of companies can be the most vulnerable. For that reason, BST could see a slowdown if the portfolio managers continue with this market cap mix. Based on the components, investors should be trading the trust higher than the more value ETFs in a good market and lower in a bad market. However, this isn't exactly the case. In the sell-off in 2018 Q4, the four ETFs fell slightly more than 17 percent while BST fell 21.7 percent. When the market rallied in 2019 Q1, BST only slightly outperformed its ETF peers at 25.9 percent. The fund only slightly beat out the Vanguard Information Technology ETF (VGT) which grew 25.3 percent. In addition to market cap diversity, BST has more diversity in geography as well. Only iShares Global Tech ETF (IXN) and BST have components based outside of the US. Even then, BST has a slightly lower US component at 70.1 percent versus IXN at 79.1 percent. In fact, BST boasts an emerging markets component of just over 18 percent leaving it vulnerable to slowdowns in economies like China and Brazil (which combine for 16.8 percent of BST's portfolio). In January 2019 update of the World Economic Outlook (WEO), the IMF voiced concerns for emerging market growth in 2019 dropping its GDP projections for the segment by 0.2 percent from WEO in October 2018. In comparison to some of its passively-managed peers, BST looks like it could underperform as a technology portfolio. With macroeconomic pressures threatening growth, the market-cap mix of the fund, as well as the sizable emerging markets component, could lead to underperformance. This is especially the case if BST sees larger drawdowns and smaller rallies against other major ETFs. With that in mind, BST could probably be replaced by other more value-based technology stocks that have similar upside potential and less volatility on the downside.